With the continued increase in electric costs and improved solar panel technology, residential solar systems are becoming very popular. 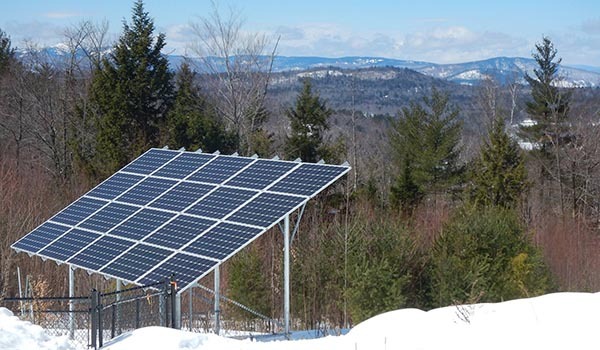 Grid-tied photovoltaic (PV) systems consist of solar panels, an inverter (sometimes more than one), power conditioning equipment, and a connection to the utility system (grid). By tying the solar system to the utility grid, excess electricity that’s produced can be “sold” back to the utility or credited to the producers account and used to offset times when the solar system isn’t producing sufficient power for the home. The home can still draw power from the utility grid during the night, or poor solar generating days due to weather or time of year. One of the first decisions to be made with regard to installing a PV Solar System for your home is whether to use a roof mounted or ground mounted PV system. Roof mounted systems are mounted directly to the roof in a fixed position. Depending on the orientation of your roof the efficiency of the system will vary. South facing roofs are ideal and its important that they are not shaded by trees or other nearby buildings. Ground mounted systems can be either fixed or tracking. Fixed systems are oriented for the ideal southern exposure and avoidance of shading from trees and buildings. Ground mounted tracking systems come in two different versions. Single-axis tracking and dual-axis tracking. Single-axis trackers follow the sun from east to west in a single line. Dual-axis trackers an follow the sun more precisely in a circular motion from the east to west improving efficiency even more. Roof Mounted PV Systems – Roof mounted PV systems are typically the least expensive to install because the roof becomes the supporting structure. While this type is often the cheapest, it comes with some compromises such as: roof penetrations, fixed orientation to the sun, extra roof loading on your home, and the need to remove the panels when new roofing is needed. Ground Mounted Fixed PV Panel Systems – These are a great option when a roof isn’t large enough or doesn’t have a good southern exposure. These are cheaper than the tracking units but do require space in your yard. A nice benefit over the roof mounted systems is not having to remove them for a new roof. Ground Mounted Single-Axis Tracking PV Panel Systems -These are typically used for non-residential large scale systems. Not likely to be an option for home owners. 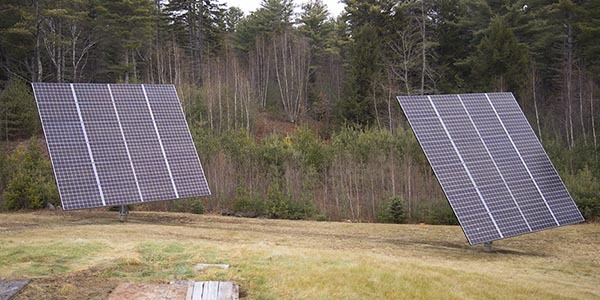 Ground Mounted Dual-Axis Tracking PV Panel Systems -These are the most expensive yet most efficient systems. The increased efficiency will certainly pay for the extra construction costs over the life of the system. These systems are often smaller in size as well due to the increased efficiency. In some cases these can be as much as 40% more efficient compared to a fixed roof system. Tracking systems can require some additional maintenance to the tracking motors. I recently had a large ground mounted, dual-axis, tracking system installed at my home. The system is 14.4 kw in size due to our very high electric consumption. Our peak usage occurs in the summer time when we have central air running, a pool heater, and electric dryer. This is an ideal situation because the summer season is also the highest solar potential especially here in New England. However, even though our high usage matches well with our high production, net metering allows us to store electric credits when we produce more than we use, and apply those credits to times when we’re using more than we’re producing. What’s really neat about a net metered system vs one that uses batteries to store the excess power, is we’re helping power neighbors homes. When excess power from our system goes back out to the street through the meter, it’s used by adjacent properties. At the end of each month the power bill can vary depending no the time of the year and power use. In some months users might have a small net power charge for any supplemental electricity needed that wasn’t produced. Some months the bill may include credits for excess power that was generated. Those credits can be applied to future bills. 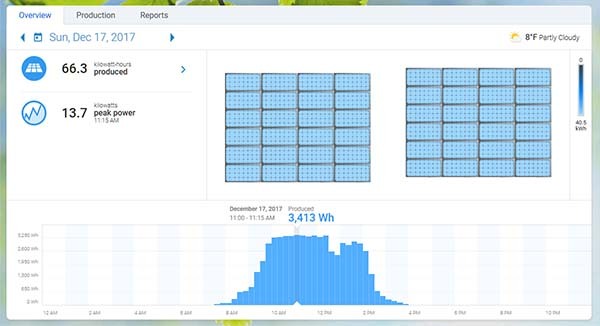 Above is a snap shot from our solar monitoring software that tracks our daily power generation. On this particular day we generated 66.3 kw-hours of power. We likely used about 90 kw-hours of power for the day so the net power needed from the grid was only about 24 kw-hours. This was on December 17th, which is almost the shortest day of the year, so as the days get longer, and the sun gets higher in the sky, the system will generate much more power. 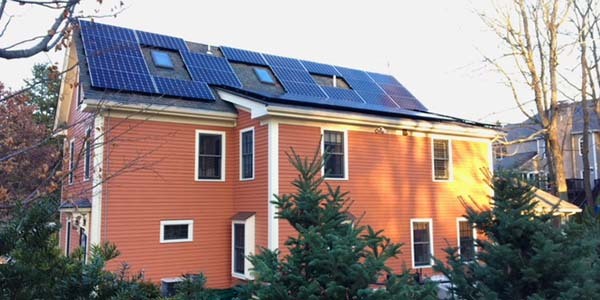 Does Solar Power Make Sense For Your Home? Lately lots of our customers have been asking about the financial feasibility of installing a solar power system at their home. In most situations a solar system does make financial sense in the long term. So if you’re planning on being in your home for quite some time, and you’ve got the room for a system whether on your roof or in your yard, the long term payoff in most cases makes good sense. The system I just installed at home home was just over $50,000 to install. However, with an average power bill just north of $6,000 a year, and a 30% tax rebate on the installation, the payback is only around 6 to 7 years. The system will perform for well over 25 years and likely longer than that so the math made lots of sense for us. If you’re interested in going solar, call several installers, meet with them, ask lots of questions and get several estimates. Do your home work, check references, and look at all the numbers to see if the payback meets your financial needs and goals. Good luck! Say Goodbye To Incandescent Light Bulbs – Buy In Bulk Now! Instead of the first thing to look at being method of installation, first you need to find out if it is even legal where the installation will be and second would be if the utility will purchase the excess power. Not all states have the same lax laws as others. Ken – Great comment, I’ll add some info in there about that as well. 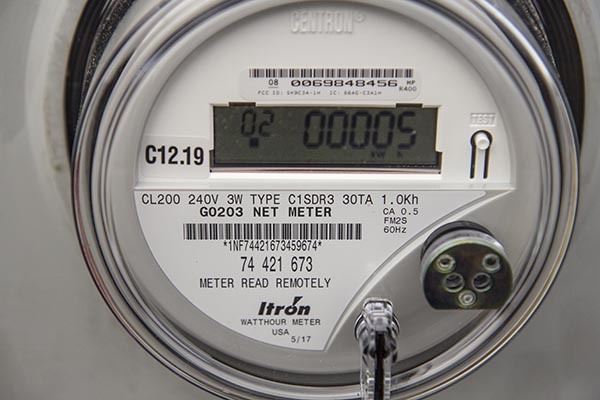 Obviously zoning issues are a big deal, and understanding the local net metering rules. Looking at a similar installation. What tracker system did you use?